Sufi whirling (or Sufi turning) (Turkish: Semazen borrowed from Persian Sama-zan, Sama, meaning singer, from Arabic, and zan, meaning doer, from Persian) is a form of physically active meditation which originated among Sufis, and which is still practiced by the Sufi Dervishes of the Mevlevi order and other orders such as the Rifa'i-Marufi. It is a customary meditation practice performed within the Sema, or worship ceremony, through which dervishes (also called semazens, from Persian سماعزن) aim to reach the source of all perfection, or kamal. This is sought through abandoning one's nafs, egos or personal desires, by listening to the music, focusing on God, and spinning one's body in repetitive circles, which has been seen as a symbolic imitation of planets in the Solar System orbiting the sun. In 2005, UNESCO proclaimed the "Mevlevi Sema Ceremony" of Turkey as one of the Masterpieces of the Oral and Intangible Heritage of Humanity. 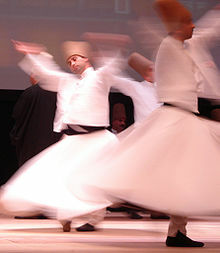 In Egypt, the practice of whirling has been adapted as tanoura (Arabic: التنورة‎ el-tanoura). 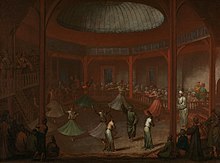 The word tanoura or tannoura refers to the colorful skirt worn by the whirler, with a color representing each Sufi order. 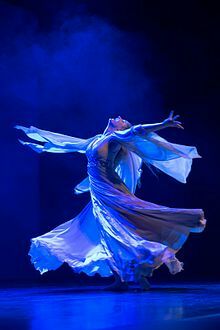 The word may also refer to the dancer, traditionally a Sufi man. Tanoura is associated with Sufism and is performed at Sufi festivals, but it is also performed by non-Sufis as a folk dance or concert dance. In Sufi shrines in Pakistan, such as the Lal shrine in Sehwan, Sindh, the practice of Sufi whirling is called Dhamaal and is performed to honor Sufi saints, or qalandars. Unlike the Turkish practice, Dhamaal may be practiced by any devotee – priests as well as pilgrims. Dhamaal is usually preceded by the beating of a drum (naghara) and ringing of bells, as pilgrims raise their hands, start to skip steps standing at one place and gradually work into a trance as the beats get faster. As the beats get faster, rhythms change and the drum beats are accompanies by the playing of shehnai. Practitioners associate the dance with Lal Shahbaz Qalandar and with protests following the Battle of Karbala. They regard the rhythm of the drum to evoke the rhythm of the creation of the universe, as illustrated in the concept of Kun Fyakun. The tanoura tradition has attracted some interest from Westerners in the belly dancing community. These performers include both men and women, solo and in groups. Such performances may be augmented with pyrotechnics or props, such as veils, wings and ribbons. [non-primary source needed] The techniques used in Egyptian Tanoura can also be adopted by belly dancers to help with their balance and control dizziness. ^ "The Sema of the Mevlevi". Mevlevi Order of America. Archived from the original on 21 December 2012. Retrieved 26 March 2009. ^ a b c Schimmel, Annemarie. Mystical Dimensions of Islam. Chapel Hill: University of North Carolina press, 1975. Print. Page 325. ^ The Mevlevi Sema Ceremony UNESCO. ^ Jamjoom, Mohammed (16 December 2010). "Change is afoot for 800-year-old whirling dance". CNN. Turner Broadcasting System. ^ Sherwan, Atique (February 17, 2017). "Deadliest Sehwan attack fails to bar devotees from holding Dhamaal at shrine". Outlook Pakistan. ^ a b Shaheer Ellahi Khan (2015). "Sufi Dance in Pakistan: Anthropological Insights on the Concept and Origin of Dhamal" (PDF). Science International. 27 (2): 1641–1643. ^ McLaren, Nicole (11 January 2013). "Whirling: Meditation in Motion or Spectacular Show?". Gilded Serpent. ^ How to Tell if You're a Member of the 4 A.M. Club. Doctor Oz. Event occurs at 3:12. Retrieved 2016-03-18. Meditation has been shown to be relaxing for the brain, and I like a moving meditation, so I thought of Dervish whirling. 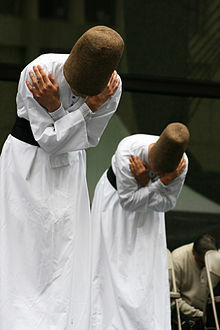 Dervish whirling is an ancient technique. It's from the 13th century in Turkey. ^ World Record for Sufi Whirling. Afaq (in Arabic). BBC Arabic Television. 2012. ^ Lukhi, Angela (23 March 2015). "Dancer Nicole McLaren puts her fans in a record-breaking spin in Switzerland". Newsivity. Guavo Media. ^ "Most people sufi whirling". Guinness World Records. Retrieved 2016-03-21.